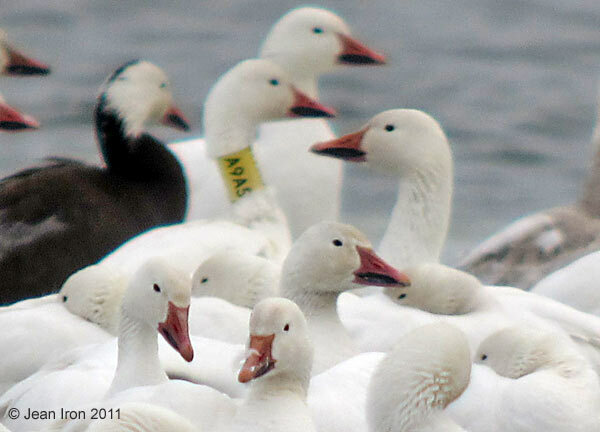 While watching thousands of Greater Snow Geese at Lancaster, Ontario, on 28 and 29 March 2011, I photographed 24 birds with yellow neck collars, and submitted the letter/number combinations to the Greater Snow Goose research team at Laval University in Quebec City. 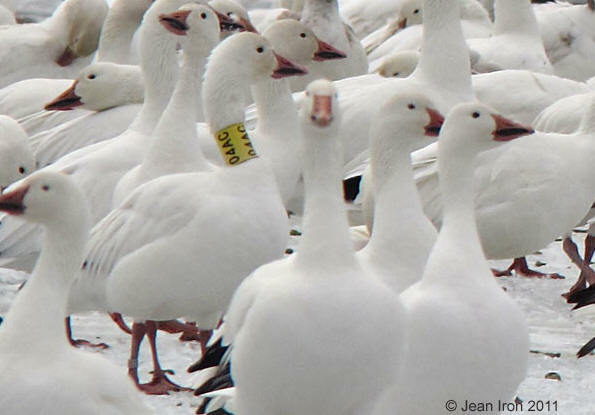 Marie-Christine Cadieux replied promptly with the date and where the geese were banded and the resightings log. PT06, a female, was banded on 9 August 2008 on Bylot Island, Nunavut, Canada. It was resighted six times in Quebec in 2009, once in April at Lac Saint-Pierre and Baie-du-Febre, and five times in fall at Trois-Saumons, Saint-Vallier, Bellechasse, and Victoriaville. Photo: 29 March 2011 near Lancaster, Ontario. 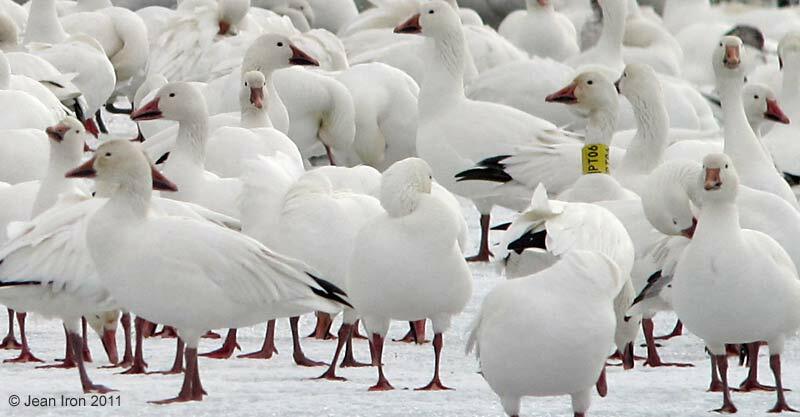 The main breeding area of Greater Snow Geese is in the eastern Canadian Arctic, where the largest colony is on Bylot Island, Nunavut. They winter along the U.S. Atlantic coast from New Jersey to South Carolina. MT70, a female, was banded on 7 August 2006 on Bylot Island, Nunavut, and resighted in November 2006 at Granby, QC, in October 2008 at Saguenay QC, in October 2009 at Victoriaville, QC and in November 2009 at Chincoteague Island NWR, Virginia, USA. Photo: 28 March 2011 near Lancaster, Ontario. 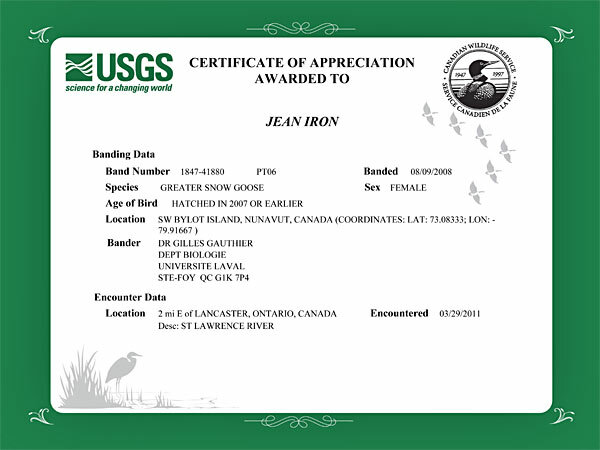 A9A5, also a female, was banded on 31 July 2007 on Ellesmere Island, Nunavut, and resighted in March 2008 in Pennsylvania, USA. Photo: 29 March 2011 near Lancaster, Ontario. 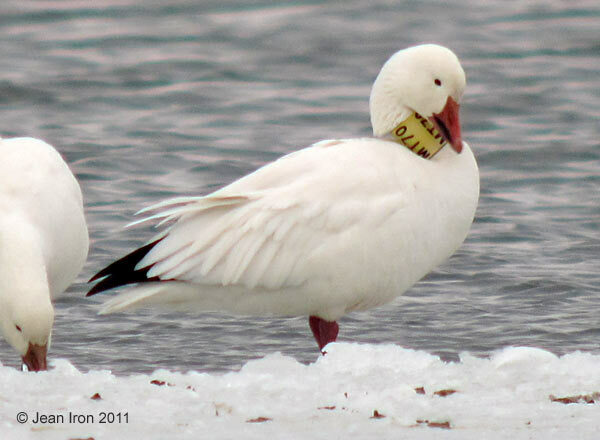 04AC, a female, banded in April 2007 at Îsle-aux-Oies, Quebec, was resighted 11 times: twice in November 2007 at Victoriaville and once at Granby, QC, four times in October 2008 at Cap Tourmente and Saint-Joachim, QC, twice in December 2008 at Prime Hook NWR, Delaware, USA, and once in October and November 2009 at St-Jean-Port-Joli and Saint-Vallier, QC. Photo: 29 March 2011 near Lancaster, Ontario. I also reported the collar combinations to the Bird Banding Office in the USA and received a Certificate of Appreciation for each. This Certificate is for PT06, the goose in the first photo. Marie-Christine Cadieux of the Departement de biologie & Centre d'études nordiques at Université Laval, Quebec, provided details about neck collars and answered my questions.